CoinNews photo of 2018 America the Beautiful Quarters. The designs honor Pictured Rocks National Lakeshore in Michigan, Apostle Islands National Lakeshore in Wisconsin, Voyageurs National Park in Minnesota, Cumberland Island National Seashore in Georgia, and Block Island National Wildlife Refuge in Rhode Island. 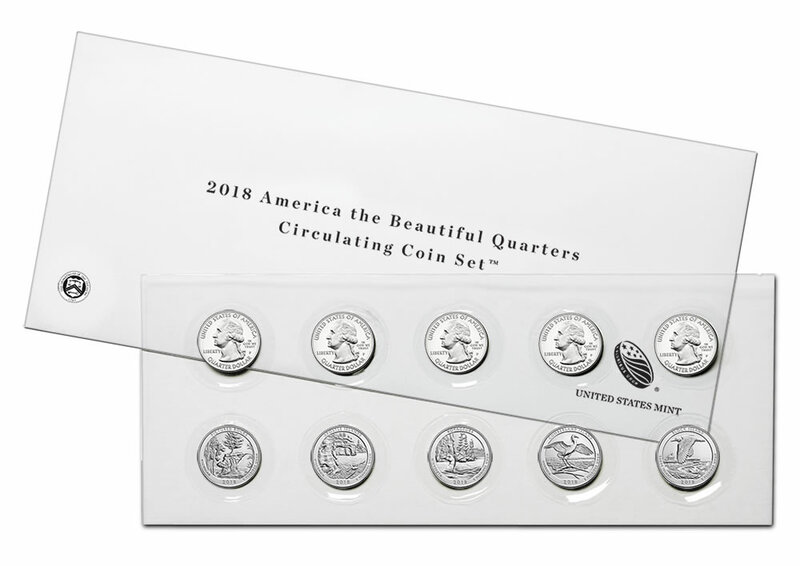 Named the 2018 America the Beautiful Quarters Circulating Coin Set™, the collectible pairs 5 quarters from the Denver Mint with 5 quarters from the Philadelphia Mint. These are the same two facilities that are tasked with making U.S. coins for circulation. Michigan’s Pictured Rocks National Lakeshore. Wisconsin’s Apostle Islands National Lakeshore. The U.S. Mint’s series of America the Beautiful Quarters® was introduced in 2010. Since then, companion quarter products have been released annually for collectors. Prices for the 10-coin sets have changed over the years, ranging from $5.95 to $9.95. This year’s set is $8.95. Their inexpensive price and easy-to-open packaging is their main attraction. The packaging protects the quarters while allowing them to be easily removed and placed in coin albums or other storage products. 21,911 for the 2017 set (available for $5.95). Order the new or older sets from the U.S. Mint’s online page for quarter products, or call 1-800-USA-MINT (872-6468). These sets have no mintage or household ordering limits.